Hello Blog Friends! Can you believe how fast this week has gone by? It feels like it was just the weekend and here we are coming up on a new one!! I have not been feeling too well the past couple of days. I think I have a stomach bug of some sort but today I managed to create another Easter card. 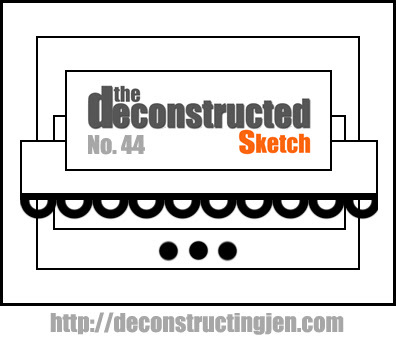 I used the Deconstructed Sketch #44 for my card and my card is 5x5. I used Bazzill cardstock for the base of my card and for my matted layers. The patterned papers are from the Darling Dear Collection from MME. The butterfly stamp is a dollar stamp I got at Michael's from Studio G. I stamped it onto some MME's patterned paper from the Bella Collection and then added some Golden Diamond UF Glitter by PKGlitz around the edges. My stamped sentiment is another dollar stamp I got at Michael's. I stamped that onto some Bazzill paper in momento tuxedo black ink. I added some baker's twine to my sentiment and I also wrapped it a couple of times across my middle layer and added a cute glizty gold brad. 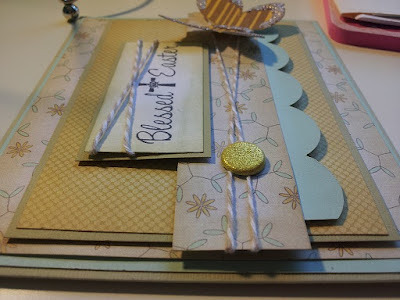 My scalloped edge was created using my Spellbinders edgeabilities and my cuttlebug. I inked all around the edges of my layers using some antique linen distress ink. The sentiment, scalloped edge and twined layer are all popped up using some dimensionals. For the inside of my card I added some of the Darling Dear patterned paper and cut it into a banner and wrapped that with some of the twine. 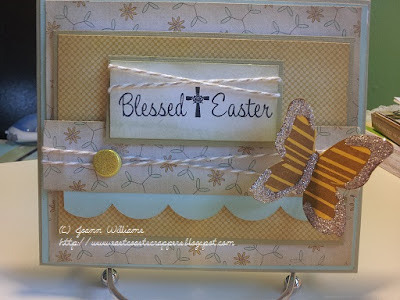 I stamped a cute Easter stamp from Hampton Arts using my Zig markers. The inside sentiment I created myself with a whimsy alphabet stamp set that I have had for a long time and I apologize but I do not remember what stamp company I got this from. Well thats it for my card today! Thanks for stopping by and I hope you have a wonderful day! 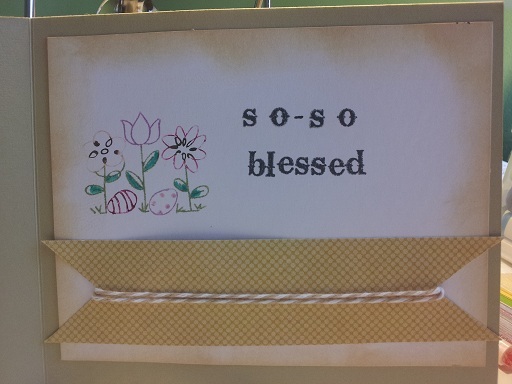 Hey Joann, Keep up the good work this card is absolutely beautiful. I like how your skills stand out by your use of the copics. I love your work. I look forward to seeing your next project. Beautiful card, Joann! I love the bling on the butterfly. Thanks so much for stopping by during the Paper Smooches April Release Blog Hop! Fantastic job on the sketch and I love the colors. Thank you ladies for the wonderful comments! I so appreciate them!